Everybody learns from disaster – but why not get your education before it strikes? When fire, flood, severe weather, or other natural catastrophes hit home, keep in mind the following pointers from our local experts to stay safe and be prepared – before, during and after. Disaster can strike anytime, anywhere. The old adage, "better safe than sorry," is especially true when preparing for the potentials that can befall your home. If you're not up to speed on your home insurance policy, take the time to meet with your insurance agent to educate yourself on your current coverage. Review key information including what types of damage your policy covers, and the extent that your policy covers personal contents and structural damage. Your insurance coverage should also outline how you will be reimbursed for valuables that are destroyed. A replacement cost policy reimburses you for the cost of buying new items, while a cash value policy covers the cost of items minus depreciation. Empower yourself and your family by developing emergency plans to respond to some of the more common disasters like fire, flood, earthquake, or severe weather. "Call the Red Cross and get their emergency preparedness plans so that everyone has a plan for getting out of the house and for meeting at a central location," advises Kara MacDonald, marketing director at ServiceMaster of Alaska. You may be surprised at how common sense can escape you in the midst of the unexpected, but an emergency plan will offer a sound strategy for who to contact, where to evacuate, and where to rendezvous off-site afterwards. Family members should also be aware of utility shut-off locations and under what circumstances to turn them off, including water, gas and electricity. Another proactive tip is to inventory and document belongings in the event they are destroyed. "When a home is damaged by fire, the task of determining what was there can be difficult because it is literally destroyed," explains Lisa Brest, co-owner and general manager of Taylored Restoration Services. "It would take so little effort to run through your home with a video camera and do a verbal/picture inventory of each room." This can be a key piece of evidence for the claims adjuster when evaluating the value of belongings damaged. Although the threat to your home may have passed, major health and safety hazards could still remain. For instance, if frozen pipes or dishwasher leaks have resulted in flooding, you'll want to shut off the water line to prevent additional damage. Limit yourself to actions that mitigate further damage, but don't try to solve the problem yourself. "The most important thing a homeowner needs to understand when they have a home loss is that it is in their best interest not to try to deal with it themselves because it could ultimately end up in denial of a claim, or create further damage," continues MacDonald. Following any disaster, call your insurance agent as soon as possible to inform them of the situation, regardless if it is after hours or on the weekend. "If a policyholder does not contact their insurance at the time of loss and waits even a week, especially after flooding has occurred, the whole house can be contaminated with mold and the entire claim could be denied," explains MacDonald. Your insurance company will dispatch a claims adjuster to assess the damage to your home and determine the amount of money you will receive for repairs. This will often be separated into two checks – one for structural damage and another for personal belongings. If warranted, you may also receive an additional check for living expenses if your repair requires you to vacate the home. Second, contact a licensed, bonded and insured contractor, and review if they have any documented disciplinary issues. You can also request the contractor provide customer references to verify the quality of work. "Getting a recommendation or checking references is a good way to find out if you have someone who will take care of you," Brest explains. "If something does not seem right, you should be able to ask your contractor about it." While it's important to do your homework, you should also identify a contractor quickly. "It is imperative to call a restoration contractor immediately following the damage in order to meet with the insurance adjuster to get a clear scope of work in order for the mitigation and repairs to be completed," says MacDonald. Without the guidance of a knowledgeable expert, you could put your home at risk for additional damage resulting in days, weeks or even months of repair work. "We have seen relatively small damage morph into a huge disaster because the building was boarded up but not dried," notes Brest. "Right after a fire, there was a roof to be replaced and some drywall damage. The house sat wet, and mold grew, mushrooms grew, and even the electrical became corroded. It went from a $200,000 fix to a $750,000 fix." Once you've settled on a contractor, they will draft a contract that should include your agreed-upon terms, a summary of the work to be done, materials to be used, the total price (or how the price will be calculated), specific timelines and provisions outlining what will happen if the contractor fails to meet deadlines. Experienced restoration contractors will have the expertise to know the proper steps for dealing with the aftermath of each unique circumstance. 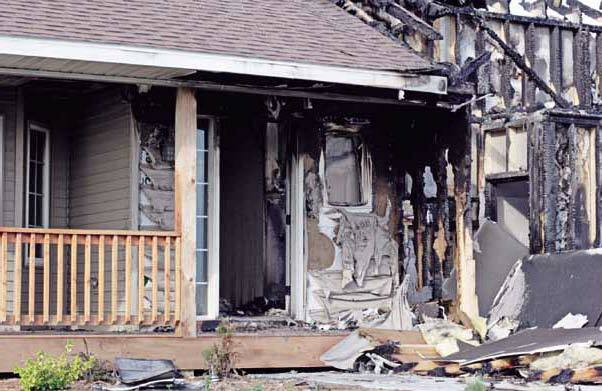 In a fire, for instance, your contractor may need to perform corrosion mitigation and save items of value, but the insurance company may wish to examine the home to determine the cause of the fire, making it important to avoid tampering with items they need to examine. "While we work at preserving information, we also balance that with giving priority to certain items that need attention more quickly than others," Brest notes. "For instance, both guns and grandfather clocks are very sensitive to smoke and should always be treated as a high priority." In the aftermath of a flood, contractors will want to perform water extraction as soon as possible to minimize the spread of water damage to other areas of the home, and will subsequently monitor the temperature and humidity to ensure proper drying and the prevention of mold. In the event of wind damage, contractors will often wait until the severe weather has subsided before initiating repairs, and can often provide temporary patching to damaged roofs. Once you have an agreement in place with your contractor, be patient. Contractors will work hand-in-hand with the insurance company during the restoration process. Oftentimes, you can even authorize the contractor to work directly with the insurance company to receive payment thereby reducing delays. "Sometimes it may feel like the repairs are not going as quickly as expected, but (homeowners) also need to understand that all items need to be approved through the insurance company," adds Proudly serving Alaska since 1972 MacDonald. When entrusting your beloved valuables to contractors, make sure the contractor has a dedicated person to maintain an inventory of items taken to be cleaned, or are broken, or unsalvageable. These employees will often have background checks for greater peace of mind. "If a homeowner has any special items, expensive artwork or childhood pictures, taxidermy or sensitive documents, it is in their best interest to make sure the contractor has hired specialty contractors to deal with these contents," MacDonald says. Regardless of your circumstances, don't be left out in the cold following a home disaster. Increased preparedness prior to, and the guidance of a knowledgeable contractor expert after, can save you time, money and heartache.